Sandra Choi and Virgil Abloh hosted an intimate dinner in the heart of Chelsea at the Taglialatella Galleries in celebration of the highly anticipated Off-White™ c/o Jimmy Choo collaboration. The collection unites Virgil Abloh’s cult fashion label Off-White™ with British luxury accessories brand Jimmy Choo presenting a fresh aesthetic to luxury footwear in a capsule collection of styles. The much anticipated collection was presented in Paris at the Off-White™ ready-to-wear show. Bespoke marble tables were adorned with Kurt Rausch commissioned installations that included ranunculus, anemones, French tulips, English garden roses, silver ferns, and ivy vines. Guests enjoyed plates created by Olivier Cheng that included gem lettuce salad, chicken pot pie with wild mushrooms and seasonal vegetable, branzino with leeks, fennel, chard and carrots, followed by sticky toffee pudding with crème fraiche. They ended the night with bespoke Jello shots. The soundtrack for the night was provided by twin DJs SimiHaze. Among the attendees were Sandra Choi, Virgil Abloh, Bella Hadid, Kendall Jenner, Naomi Campbell, Rosie Huntington-Whiteley, Kaia Gerber, Hailey Baldwin, Anja Rubik, Giedre Dukauskaite, Rachel Zoe, Martha Hunt, Halima, Luka Sabbat, Camille Charriere, Helena Bordon, Aimee Song, Charlotte Groeneveld, Leigh Lezark, Caroline Daur, Irene Kim, Caroline Vreeland, Tali Lennox, Simi and Haze Khadra. 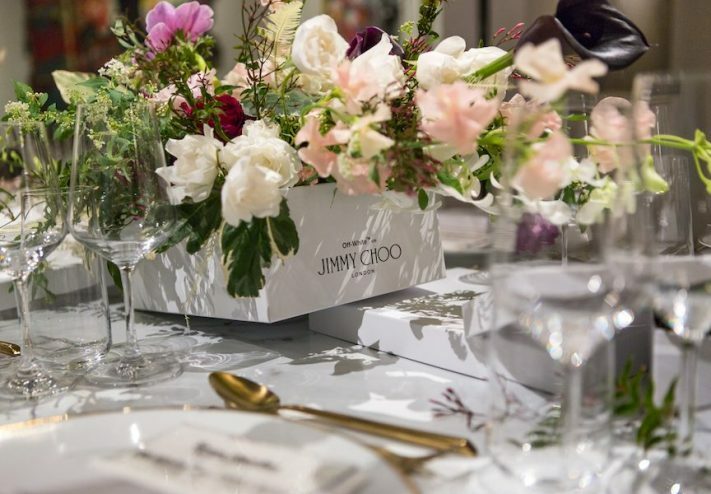 “To collaborate with a brand like Off-White™ allows Jimmy Choo to explore a new avenue and take part in a different conversation. I love to mix it up by getting together with a different creative mind identifying our synergies and combining our DNA to create a beautiful and surprising collection with unexpected links to the roots of our brand,” said Sandra Choi, Creative Director Jimmy Choo. “Creative dreams were fulfilled when able to combine the young exuberance of Off-White™ and the storied elegance of Jimmy Choo,” said Virgil Abloh, Creative Director Off-White™. The OFF-WHITE™ C/O JIMMY CHOO collection will available globally from February, 21st 2018 onwards. While Brands Thrive on Logos – Diesel Makes Up A New One!